Could two new concepts debut this week in New York? The Jeep Sandstorm concept is going to the annual Easter Safari — it's a truck. Everyone knows pickup trucks are a big deal and a couple of new ones from Jeep and Volkswagen are apparently coming closer to reality. First off is the Jeep pickup truck built off the new Jeep Wrangler platform. Fiat Chrysler Automobiles N.V. officials confirmed that the Jeep pick-up truck was under development a long time ago. In fact, FCA CEO Sergio Marchionne predicted Jeep could sell as many as 100,000 annually once production gets rolling. But up until now FCA has been a little vague about when it might actually enter the showrooms. 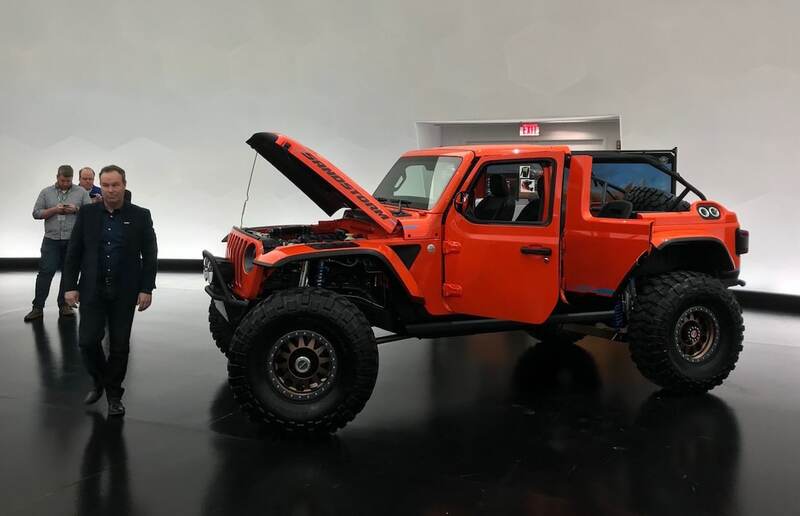 However, FCA officials spread the word during the recent convention of the National Automobile Dealers Association in Las Vegas that the new Jeep pickup would be showroom ready by April 2019, according to Automotive News. Production could begin as soon as the fourth quarter of this year. The Comanche was a Jeep Cherokee-based pickup. While Jeep is expected to bring back a pickup, no word yet on the name. More news about the next Jeep pickup is likely to come on June 1 when Marchionne is expected to lay out the company’s next five-year plan. Speculation is that the new Jeep pickup will actually be part of a new family of pickup trucks to compete with vehicles such as the Chevrolet Colorado and Toyota Tacoma and Honda Ridgeline. Jeep made the Comanche pickup until 1992 based on an old version of the Cherokee, which was phased out years ago. Meanwhile, word from Wolfsburg is that Volkswagen is contemplating a move into the pickup truck segment. Dealers in the U.S. have begged VW to import the small pickup truck it builds in Brazil. But VW management in the U.S. and Germany have resisted the idea, saying the Brazilian-made truck wouldn’t fit in the U.S. However, word is that VW is actually studying the idea of building a midsize pickup that could be built in Tennessee as a derivative of the Atlas crossover. That truck might be shown at the New York auto show as a surprise concept alongside a new coupe-styled variant of the Atlas already scheduled for production, according to one speculative account published over the weekend. This entry was posted on Monday, March 26th, 2018 at and is filed under Auto Shows, Automakers, Automobiles, Business, Concept Cars, FCA, Jeep, Markets, New York, Pickups, Sales, Sales, Trends, U.S./North America, Volkswagen. You can follow any responses to this entry through the RSS 2.0 feed. Both comments and pings are currently closed.